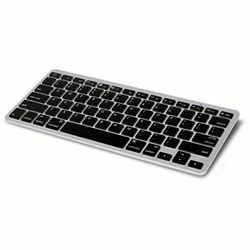 Type with real keys on your iPad® tablet, Android phone, and many other Bluetooth devices with a compact wireless keyboard. Thanks to its 80 keys, you'll be able to type e-mails, chats, text messages and more with ease. The keyboard is just over 11 inches wide, so it travels easily and can be paired to up to six devices. Requires 2 AAA batteries, not included. Requires Bluetooth device with HID profile. Love this keyboard with the Kindle Fire HD! Pros: Light, compact, but with plenty of room for big "vintage" fingers, this is the first Bluetooth keyboard I've ever been happy with. I do a lot of typing on my Kindle, and this makes it a breeze. I've used it every day since Christmas (only about a week), but I'm sold on it! Get one!